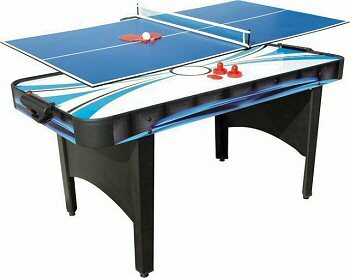 Our Mightymast 5.5ft Typhoon is a working air hockey game and table tennis table for all the family. The powerful internal electric fan creates an air cushion on which the puck can move at high speed, helped by the high-gloss playing surface. The table tennis table fits on top, providing an additional play function. Comes complete with all accessories. This table is not too large and heavy, yet provides two good games for all the family, but is especially ideal for children as it is of a more manageable size than the larger full-size tables. The puck glides well over the air cushion provided by a more-than-adequate fan. All-in-all, a very good buy if you are looking to provide an exciting family game at Christmas and beyond. With over 15 years of experience in the supply of games & sports equipment, Mightymast Leisure has become synonymous with providing quality & innovative products to both the retail & trade sectors. Although the range has expanded over the years, the core of the business still lies with the manufacture & supply of table football games - making the company one of the largest suppliers of this type of product in the UK & Ireland. This product is delivered by courier service and we will contact you by email to confirm the delivery day. Delivery of this product will usually be next day if you order before 12am. Deliveries will take place usually between 9am and 5pm, Monday to Friday (excluding Public Holidays). If there is a significant delay to the delivery route then we will endeavor to contact you to let you know.